Goals: To showcase the big innovative ideas from Medicare & Retirement, to put the spotlight on the innovators, to use the day as outreach to build the innovation community, and to highlight the flagship Member Journey Map (which demonstrated how innovations evolved from member needs and extensive research). Summary: Our client wanted to be the star of the Innovations Showcase; noticed everywhere outside the exhibit hall and with an impactful booth inside the exhibit hall. 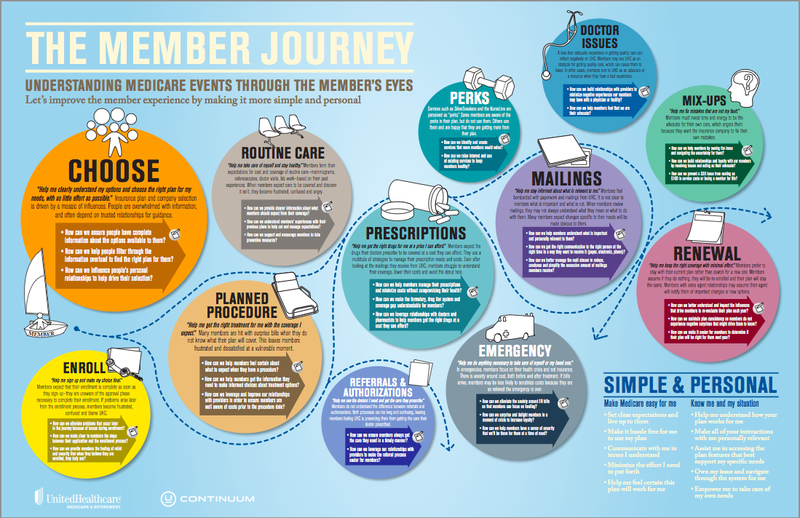 We created 12 Member Journey "walking billboards" for each area on the member journey map. At 12 different locations, people walked around with iPads around their neck, quickly demonstrating the innovations for their area of focus. Everyone in the hall got a QR code badge. When the "walking billboards" interacted with someone, they scanned their badge and that person was automatically entered into a drawing. If the person then answered a bonus question about the innovation--they got another entry. People also got additional entries for visiting the booth and playing a multi-player, interactive, hosted game show. 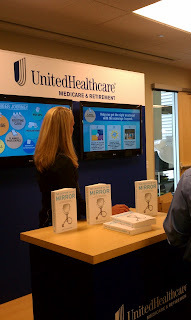 In the end, both the 12 Member Journey stations and the exhibit hall booth were wildly popular, communicated concise and memorable messaging, and made sure that UHG's M&R group were the most visible innovators around. Each station had three people--all wearing color-coded t-shirts. One person was the designated QR code badge hander-outer, one was the QR code scanner/checker and the third person was the iPad presenter. Badges: Each badge had a QR code and coordinating numbers. One portion of the badge "ripped off" like a raffle ticket. This section contained a place where they could "register" their name and email to associate it with their QR code. None of this had to be done onsite--all the attendees had to do was fill in their name and turn it in (at any point--before or after scans). QR codes: The QR codes were a way of tracking how many stations people had visited--rewarding those who visited more stations with more drawing entries for a prize. This inspired people to not only visit more stations, but to also answer bonus questions and be active participants with the information. One person at each station had a smart phone (usually their own phone) with a QR reader (downloaded and tested ahead of time). That person would scan a QR badge and then check the person in to that particular station. They would then have the option of giving the person an additional "check in" for answering a bonus question as they listened to the iPad presentations. By QR code, people were tracked and we could tell exactly which stations they visited, which questions they answered and gauge their level of interest. iPad presentations: We designed clean, dynamic iPad presentations that were quick, clean, informative, highly graphic and fun. The iPad presenter had a lanyard configuration (using decorative plate holders) that allowed them to be hands-free with the iPad--only needing to touch to advance or to change the path of their presentation. Getting people to interact at the innovation showcase booth in the exhibit hall was key. We needed a strategy that would engage viewers, communicate the message, and get them to spend MORE time at the booth. We developed a splashy, sleek game show format called "Spot the Innovation" that people could play with and against their friends and colleagues. 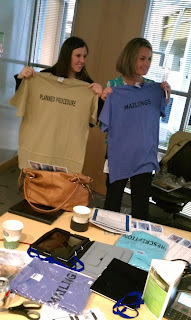 We had two hosts--one to control the game and be game show host, and the other to give supplemental information. Attendees could select a Member Journey Map "bubble"--any of them--and answer a multiple choice question about that bubble. If they got 2 out of 3 questions correct, their badge was scanned--giving them another entry into the drawing. The booth was also the place that people had to fill out and turn-in their drawing entry slips. The Feedback: Participants thought the format was both fun and unique. They enjoyed "racing around" the exhibit hall to visit as many Member Journey Stations as they could. We had a remarkable amount of participation (DOUBLE the anticipated number of badges were given out and the number of total scans were amazingly high. It was an overwhelming success! The client said, "We had an AMAZING day and so much positive feedback about the game and the exciting innovations coming out of M&R. THANK YOU SO MUCH!!!"